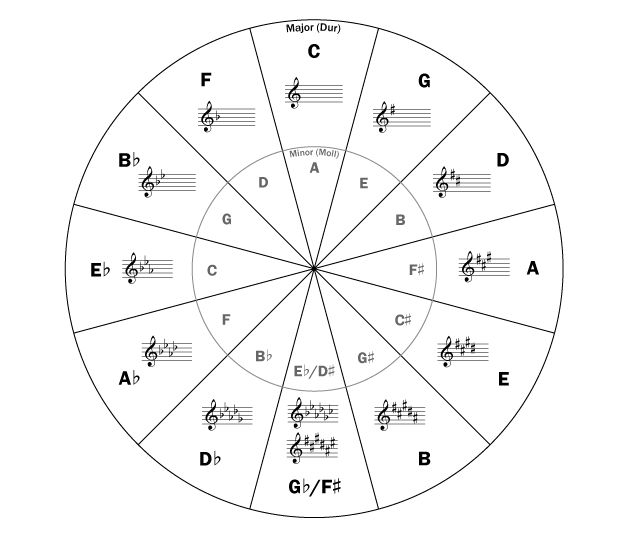 The circle of fifths always confused me, for some reason, but I eventually figured it out. The “fifth” referred to is the interval from one key signature to the next key signature. You start on one note, let’s use C, and then count up five letter names starting from C. C…D…E…F…G….5! Going clockwise from C (which has no sharps or flats) we come to G, with one sharp. A fifth up from G is D, with two sharps. Get the picture? When we finally get to F# we use it’s enharmonic equivalent, basically, we call it by another name. If you see the black keys on a piano, the black key a half step up from F is F-sharp. But that same key is also a half-step down from G, which makes it G-flat. Now we will call the key signature F-shap, G-flat, with 6 flats. A fifth up from G is D, so the key is Db with 5 flats. Then Ab with 4 flats, and so on until we are back to C.
The inner circle indicated each major key’s relative minor key (remember, major sounds happy, minor sounds sad). Simply, a relative minor key is taking a major scale and starting on the 6th note of that scale to play another scale, still in the same key. If C major scale is C D E F G A B C, then the relative minor is A (6th note) and the A minor scale is A B C D E F G A. We can do the same thing with another scale, like D major: D E F# G A B C# D. The relative minor is B minor: B C# D E F# G A B. Make sense? See the Circle of Fifths Photo on the original website, Piano Lesson Central. This entry was posted in Composition and Theory Information, Piano and tagged circle of fifths, composition, enharmonic, fifth, interval, key, key signature, key signatures, lesson, lessons, major, minor, music, piano, piano lessons, relative, relative major., relative minor, theory. Bookmark the permalink.